DIARY OF A PUBLIC SCHOOL TEACHER! : "Wellll...You Chose this Profession..."
Well, let's just say we had differing points of view on various details and just as the conversation was about to end, before it became violent(jk), she said, "Well just keep in mind, you chose this profession..." She said it more than once! No, I did not start screaming and my head did not spin around three times, I just ended the conversation.You see, this is something I have heard from my husband on various occasions when I guess he feels I am over-venting. This is something I see in the Comments section on Facebook from non-educators. This is not something I expected to hear from my friend. But, here's what many people don't understand, once you leave the classroom your perspective changes. You forget the day to day grind of giving your heart and soul to and for these kids, that feeling fades. And I know there are admin who still try to place themselves in the shoes of classroom teachers and those who still work directly with our children, but it's difficult. They have so much going on, and so many other people they have to answer to, sometimes they forget, or could care less, what is required of us as educators. 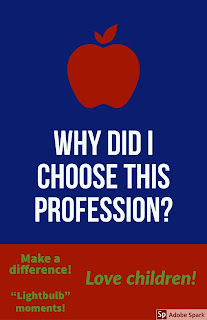 But the words, "You chose this profession..." make me angry. Those four words imply that, because we choose to teach,we are supposed to put up with everything and anything that is placed before us, whether we like it or not. Because we chose this profession we should write IEPS for half our class at school, at home, and anywhere else we can find time to write them and not ask for more time. Then still bust our butts finding a way to meet the needs of our students with IEPs in the classroom. Because we chose this profession we should be happy when we have a class size of 25 and over, even though research has proven that class size matters. Yeah, because good teachers can handle 30 or more kids. Because we chose this profession we should be delighted that instead of letting us teach using the skills we have honed, we are required to follow every "new thing" or new book, that is thrown at us once,twice, or three times a year. Because we chose this profession we should forget that we are professionals and should have control over our Professional Development. No, better we waste countless hours at PD that is forced upon us. 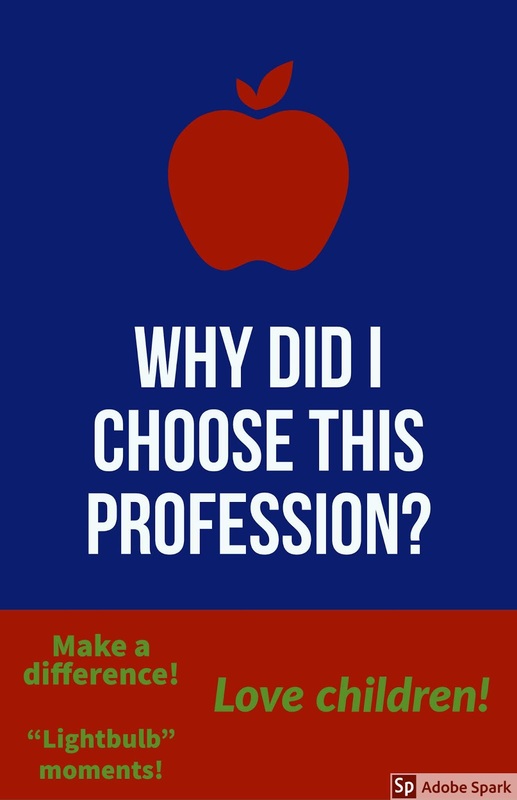 Because we chose this profession we should have no problem taking money out of our own pockets and buying supplies, books, and all the other things educators pay for to make sure their students have what they need. I chose this profession because I wanted to make a difference in a child's life. But let's not get it twisted, just because we chose this profession, doesn't mean we shouldn't be treated with anything other than the respect we deserve. It doesn't mean that we should be seen and not heard. It doesn't mean that someone gets to say that we should put up with things that stand in the way of making us the type of educator that is doing the best for our kids. What should be said is, "I thank you for choosing this profession and I will do whatever I can to help you work in an environment where you will thrive, along with your students." Watch the video below and tell me if these Oklahoma educators deserve what happened to them because "they chose this profession."